In an incident which seems like it epitomizes much of the anger and bitterness of this election season, a McCain campaign worker from College Station, Texas who was in Pittsburgh helping to work a phone bank was robbed and then attacked, brutalized, and disfigured in what appears to be a politically motivated hate crime. According to a report from television station KDKA, on Wednesday night, 20-year-old Ashley Todd was robbed at knifepoint at an ATM near the Republican phone bank where she had been making calls on behalf of the McCain campaign. After taking $60 from her, the robber noticed the McCain bumper sticker on her car and became enraged. The man hit her in the back of the head, knocked her to the ground and began punching and kicking her. He threatened her with the knife at her throat, finally carving a letter “B” in her cheek. During the attack he reportedly shouted “you are one of those McCain people,” making the political motivation of the attack clear. The attacker was described as African-American and about 6′ 4″ tall with a medium build. Todd is one of 50 college Republicans working for the McCain campaign and is maintaining a blog of her experiences on the campaign trail. 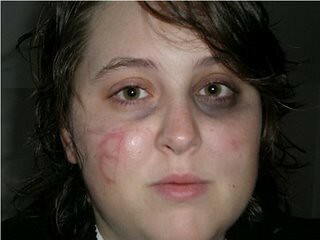 The picture to the right appears to be her based on photos from her blog and shows her with a backwards “B” on her cheek and a black eye. Its provenance is unknown. In response to claims from pro-Obama bloggers that the story is fabricated and that she mutilated herself, Todd has offered to take a lie-detector test administered by the police. Police will also be viewing ATM video footage to verify her report and attempt to identify the attacker. You fell for this crap? Typical right-wing nonsense. Campaign’s in the crapper? Blame a scary black man. Note that this was a straight up news report which is based on the facts as they were known last night, before Todd confessed to the hoax. And where you get the idea this had any connection to the McCain campaign besides coincidence is beyond me.